Phlebotomy can lead to other healthcare careers by providing the necessary clinical experience for entry into such fields as Diagnostic Imaging, Sonography, Nursing, Physician Assistant or Medical Doctor. Look what healthcare facilities think of Red Rocks Phlebotomy students! A health professional who obtains and processes blood samples as well as other laboratory samples. AMONG THE FASTEST GROWING OCCUPATIONS- This are among the fastest growing occupations in Colorado and in the nation with a growth rate within the occupation anticipated to be above the average according to the Bureau of Labor and Statistics. 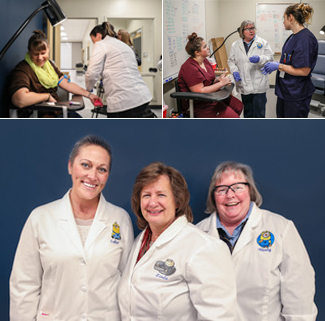 To prepare confident, qualified and nationally credentialed healthcare phlebotomy professionals to work as a healthcare team in various healthcare settings by providing an innovative learning environment that emulates the workforce environment. This program is designed to prepare the student to be a skilled Phlebotomist in the health care industry. The student will receive extensive and varied program of study that includes theory and practice, specimen set-up and processing, medical terminology specific to the laboratory, customer service skills, regulatory issues, venipuncture and capillary technique and numerous other collection procedures. The Healthcare Industry has moved toward requiring national certification and our program at Red Rocks Community College partners with (AMT) American Medical Technologists to provide our graduating students with the ability to take their national certification to become a (RPT) Registered Phlebotomy Technician. To enter the phlebotomy program, the first step is to go through the admission process for RRCC. Once admitted you can begin registration. Meeting the requirement of placement at the level of ENG 121 by having taken CCR 092 or CCR 094 or an English course equivalent or higher to ENG 121. See below for options. The Medical Terminology (HPR 178) and Phlebotomy (HPR 112) are to be completed in your first semester. Attendance to the phlebotomy course is mandatory as it is a skill course and hands-on practice is key. Please make sure you do not have conflicts for attendance as making up a class activity is difficult but mandatory. HPR 180 internship occurs the semester following completion of HPR 112 Phlebotomy. This internship must be taken within 4 months of completing HPR 112. This is a full-time internship M-F during normal daytime business hours for approximately 3 1/2 weeks. You must be available full time and the sites are prearranged so dates for internship run in two groups that run consecutively. It is suggested that you work no more than 20 hrs./week while in the program and working during the internship for the program must be outside normal business hours of M-F 8am-6pm. By enrolling in courses that will bring you to this level of English. You may transfer credit for this course from another accredited college or university. If you will be transferring it, the course must be at least 2 credits of similar content. Medical Terminology is a pre/co-requisite to the course so please make sure credit for the course is on your RRCC transcript or that you register for the course before registering for HPR 112 Phlebotomy otherwise the system will not recognize that you have or are currently taking it and so will deny registration. For Current dates and times of the courses please see the current course schedule. Students will be required to complete and pass a criminal background check, prior to starting their internships. Further information will be given at the start of classes. Students unable to complete this requirement will not be able to continue into the internship or finish the certificate. Students will be required to complete a health/immunization check prior to the start of class. Health/Immunization form can be downloaded here. The completed form should be presented on the first day of class. Students unable to complete these requirements will not be able to participate in blood draws, continue into the internship or finish the certificate.